Tickets on sale at Bankhead Theater website. A special “south-of-the-border” showcase shares the fun and excitement of a true holiday fiesta. Beginning with the traditional posada, a procession led by Mary and Joseph, colorful costumes and festive songs and dances ignite the senses with the spirit of the vibrant Mexican culture. 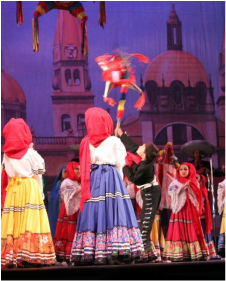 Founded in 1967 by Carlos Moreno-Samaniego, Ballet Folklórico Mexicano draws on the artistic variety of Mexico’s different regions to fill the stage in a spectacular show that makes a dazzling start to the holiday season. Buy Tickets Now for BEST seat Selection! General Admission: $35 Purchase after Dec 1 - event date. All Tickets are Reserved Seating for ages 3 & over. A children's matinee for schools. Bring your school for delightful journey of music and dance through Mexico celebrating Las Posadas.